We've all had that one turkey that drove us plum crazy. The one whose only pattern was the unpredictable. Just when we think we have them figured out, they hand us a dollop of humble pie and force us to eat a tag sandwich. These turkeys are simply different. They are comprised of a different DNA, one that almost seems supernatural. From the time they are hatched until the time they die of old age, their one mission in life is to frustrate those that hunt them. They seem to have a force field around them and only give you one chance a season to kill them, much like a mature whitetail. If you blow your opportunity, you might as well go find a love sick two year old to provide you fried turkey meat. In my formative years, I hunted a property that was notorious for producing "bad turkeys." It seemed as if the soil simply bred them to be that way. You did not kill willing three year olds or even curious four year olds. They were either textbook, fly off the roost and come on a rope two year olds, or impossible professors of hunter humiliation. There was no middle ground. The evil ones grew in legend and thus were given names like the FBI gives targets on their most wanted list. Names like Sam, the doctor, the preacher, and Jethro were given to the ones we simply could not kill. Sam was the worst of all time. An all-star crew of mercenaries tried to take him out, and time after time, they would return to camp with their lips poked out. Bad turkeys are a liability to our success, to a certain extent. First of all, no one can question that the success of a spring turkey season hinges on two year old turkeys. They are the catalyst for a loud spring and rolls of grip and grin photo sessions. However, how many times have you had a wad of turkeys gobbling and then that one turkey gobbles off in the distance and silence befalls the valley? Too many times for me personally. Simply put, bad turkeys are bad for business. Secondly, we tend to waste time trying to kill them because they get under our skin. Just like the supermodel in the corner, we think we really have a chance to get their number, and waste a lot of time when in reality we have very little chance. We ignore the hard gobbling turkeys 200 yards away and walk a quarter mile to spend a morning in vain with Dr. Evil. My most recent adversary is a turkey I've dubbed "the minister." He first began his reign on my sanity in the spring of 2009. He is a weird bird in that he does not strut; he simply drops his wings. 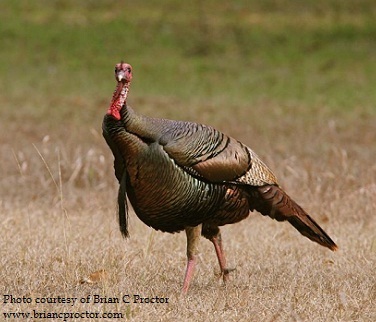 He will not gobble to turkey calls, only to cows, sirens, airplanes, thunder, roosters, and UFO's. He has no pattern whatsoever, and has given me one chance in the seasons since to kill him, all of which I have failed to do. To be fair, he is usually in a pasture, and if I were to use a strutting decoy he may be vulnerable. But since I am stubborn, he lives on. This past spring, I thought he was finally dead, which brought my heart great joy. The second week of the season, I set up on a gobbling turkey in the area he frequented. After a few minutes, I realized it was him, back for another year of ticking me off. I promptly walked away, found a two year old turkey to hunt, killed him in ten minutes, and had celebratory pancakes. I in no way shape or form felt like a quitter. I simply cut my losses and the investment paid off. I honestly hope the minister has an aortic rupture or flies into a tree sometime before March 15. I do not want to see his ugly face again. He is evil, and deserves no spoils of the victor. He deserves to live the rest of his days, if he is still alive and well, as a lonely and broken gobbler. I am sure there will be another sultan that will take his place. That is just the way things sort out. However, I can guarantee you that I will not waste my time finding out just how evil he is. I will give him one morning to die, and then I will go elsewhere. When I put my foot on another two year olds’ head, I will be glad that I did.